Sonia Gandhi, Laxmi Mittal and Indra Nooyi are in the 2007 Time 100 list of influential people. Assembled by Time magazine, the list features 100 men and women whose power, talent and moral example is transforming the world. Time is a weekly American news magazine. Created in 1923 by Briton Hadden and Henry Luce, Time has more than 173 million readers all across the world. Henry Luce’s idea for Time was to explain the news through the people who make it. The Time 100 list was first published in the year 1999, when Time magazine named the 100 most influential people of the 20th century. At the core of the Time 100 is the idea that individuals – by virtue of their character, their drives and their dreams change the worlds and make history. The list has been developed as a result of a debate among several academics. The list is totally based on the popularity of the installment. In the year 2007, Time 100 list, Managing Editor Richard Stengel explained that the Time 100 is not a list of the hottest, most popular or most powerful people, but rather the most influential people. The time 100 is now a much anticipated annual issue, in its fifth year. We divide our choices into five categories : Leaders & Revolutionaries, Builders & Titans, Artist & Entertainers, Scientist & Thinkers and Heroes & Pioneers. Sonia Gandhi’s rapid rise in the political arena highlights an interesting aspect of Indian politics – In a country, where Hindus account for a majority of the population; Indian voters have not hesitated to embrace a foreigner. When the National Congress party won the election in 2004, the party offered the prime minister’s position to her but she refused that powerful post, she said that after listening to the prompting of her “Inner voice” she was turning the position down, she had no desire to occupy the Prime Minister’s position. It was a gesture that was, well Gandhian. And it solidify her hold on power. Even when the US couldn’t be thought to be run by an Indian Hindu woman without a college degree as the US has never elected any one who is not Christian and male -even as vice president but India which is even bigger democracy is run in all but name by an Italian catholic widow with a high school education. In the 16 years since the assassination of her husband Rajiv, Sonia Gandhi has become the face of country’s most famous family. For ordinary Indians, her act of renunciation held tremendous mythic resonance. Sonia successfully adopted her mother-in-law’s mannerism and style in warming her way to large crowds which had turned up at her election rallies. Mrs. Gandhi also has an interest in literature and writing. She has published two books about her late husband, and edited two volumes of letters exchanged between Jawaharlal Nehru and Indira Gandhi. 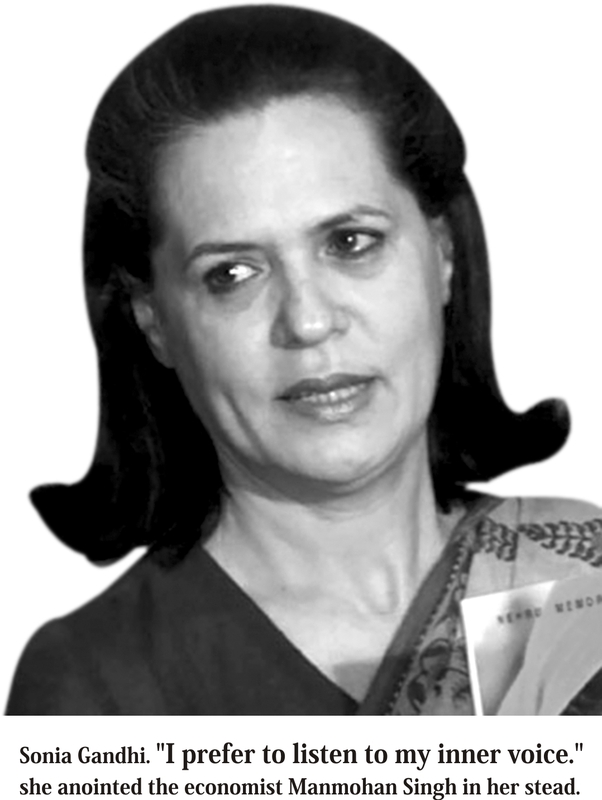 Sonia’s most lasting legacy may lie in her children, Rahul and Priyanka, one of whom may well become India’s Prime minister someday, ascending to the office that their mother has – thus far – spurned. 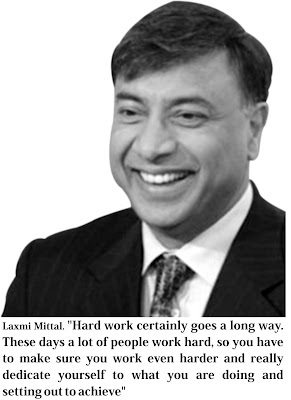 With a spirit of hard work and dedication, Laxmi N. Mittal has became the Chairman and CEO of Arcelor Mittal Steel Company, the world’s largest steel producing company and has been responsible for the strategic direction and development of its businesses. Mittal recollects his tough times when his $31 billion bid to buy Arcelor had created an international furore. It was a measure of his determination and dedication of how he dealt with the situation and came out successfully. After the merger between Mittal Steel and Arcelor, his company is now the largest steel maker in the world. Laxmi Mittal currently controls 10% of the total steel production and the combined entity that has come into force post-merger is three times the size of its nearest competitors. Mittal’s wealth and power came from achieving his dream of consolidating the global steel industry. Laxmi Mittal is also known for his opulence. For last three consecutive years, he has been the richest person in the United Kingdom. Operating in 60 countries with 320,000 employees, the Indian born, British based steel magnate is reported as the 5th wealthiest person in the world by Forbes Magazine in March 2007. His house is said to be the world’s most expensive home, it uses marble taken from the same quarry that supplied the Taj Mahal. Mittal is famously generous and charitable, although he has given millions of dollars without fanfare to tsunami relief and other causes. Mittal’s story is far from finished. His company is in the early stages of penetrating the world’s largest market, China and is not yet involved in Russia or Japan or a number of emerging market nations – enough reasons to turn any one green with envy. 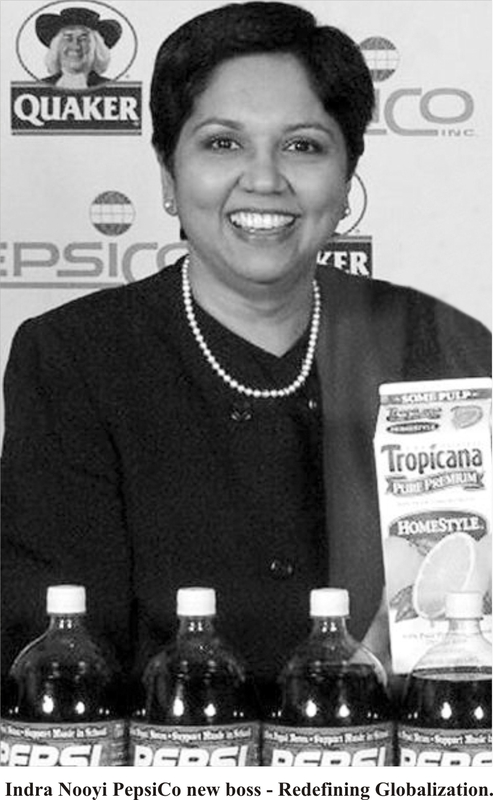 It didn’t come as a surprise to many when Indra Nooyi was appointed CEO of PepsiCo, a quintessentially American company making quintessentially American products, whose 40% of $35.1 billion sales of beverages, food and snacks account from beyond the US and most of the company’s growth is overseas. As Pepsi’s strategist Nooyi helped position PepsiCo for growth in China, the middle East and her native India.” I am a global thinker in everything I do,” she says. Her vision is performance with a purpose. Born in October 28, 1955 in Chennai, Nooyi, grew up in India. She took a B.S. in 1974 and PGDBA from IIM-Calcutta, 1976 and the Masters of Public and Private Management at the Yale School of Management in US. Before joining PepsiCo she worked for many Corporate giants including Asia Brown Boveri, Motorola and New York’s Lincoln. She has been behind the $3.3 billion-dollar-deal for the purchase of the Tropicana orange-juice brand. She was named as Chief Financial Officer in 2001. While at PepsiCo, Indra Nooyi has played a vital role in starting Tricon, which is currently now known as Yum! Brands Inc.
Indra Nooyi ranked No.1 on Forbes magazine’s annual survey of the 100 most powerful women in the world. We can learn two most important lessons of life from her success. First, you can be a working mother and climb the corporate ladder while raising kids (Indra has two). Second, you can get ahead in the American corporate environment without sacrificing who you are culturally. She attributes much of her success to her upbringing in India. Being a woman, being foreign-born, you’ve got to be smarter than anyone else.